Born in 1811, Isaac Merritt SINGER set up a company in 1851, with a borrowed capital of only $40, to manufacture and sell a revolutionary product – a machine to automate and assist in the making of clothing. Little did he realize that the newly formed I. M. SINGER and Company was destined to become the world leader in the manufacturing and distribution of sewing related products and that the SINGER brand name would one day become famous around the globe. Four years later, with a first prize at the World’s Fair in Paris, SINGER began overseas expansion there, making it the world’s first international and largest sewing machine company. By 1961, the newly incorporated SINGER Manufacturing Company held 22 patents, with annual sales of 20,000 machines. In 1867, SINGER opened its first sewing machine factory outside of United States in Glasgow, Scotland. Additional factories were established in the United States and within no time, one of the best known emblems – the Red “S” Girl trademark – became familiar worldwide. In 1885, SINGER introduced the first electric sewing machine. By 1890, the company claimed an 80 percent worldwide market share, with sales heading towards 1,350,000 machines. In 1908, the SINGER Building at 149 Broadway in New York was inaugurated. The 47 stories building, which was the tallest in the world at the time, remained SINGER’s corporate headquarters for the next 54 years. By 1913, worldwide sales of SINGER machines exceeded 3,000,000. In 1963, the SINGER Manufacturing Company changed its name to “The SINGER Company.” SINGER celebrated its 150th anniversary in 2001. SINGER began its operation in Bangladesh in 1905 when the country was a part of the Indian sub continent. Five years later in 1910, two shops were set up in Dhaka and Chittagong. In December 16, 1971, Bangladesh emerged as a sovereign state, and the East Pakistan branch office was elevated to a Country Office. Sewing Machines were made available from different SINGER overseas sources. The number of shops was squeezed to only 23 because of low volume of business. In 1983 SINGER Bangladesh listed itself with Dhaka Stock Exchange (DSE) by offering 20% of its total capitalization – 2,565 ordinary shares of Taka 100 each. It was also listed with the Chittagong Stock Exchange in 2001. In 1980 SINGER Bangladesh established a sewing machine factory in Chittagong with production capacity of 10,000 units per year, which was raised to 25,000 units in 1984. Since its inception in Bangladesh, the name SINGER has been synonymous with the sewing machine. Although SINGER Corporation started diversifying its product range in the early sixties, SINGER Bangladesh Limited was a company with a single product – the sewing machine — till 1985 when the Management realized that this product alone could not substantiate growth for longer periods and increased its product range. Today SINGER Bangladesh is a household name. It has earned the trust and confidence of consumers and is one of the leading manufacturing and marketing companies of consumer durables in the electronics and home appliance sector of the country. In 1987, SINGER Bangladesh inaugurated their Human Resource Department for the first time in their organization. During that time, only one Personnel Manager used to carry out all the activities of the HR department. Since then, the HR department has been improving day-by-day. • Efficient processes and services e.g. in training and recruiting. The HR manager of SINGER assists the line manager in order to remove the conflicts raised between manager & employee, manager & manager and employee & employee. The HR manager of SINGER determines the duties and skills required for a job and the kind of person who should be hired for it. For this purpose, they prepare job description and job specification. The HR manager recruits the employees from two different sources, one is the internal source and the other is external source. But basically, they prefer to go for the internal recruitment. For selection purpose, they use various selection tools, such as for the entry level people, they use screening and panel interview and for the upper level people, they basically focus on interview performance & analytical ability of the candidate. The HR department arranges an orientation program for the new employees. The HR department of SINGER supports the off-the-job training programs. 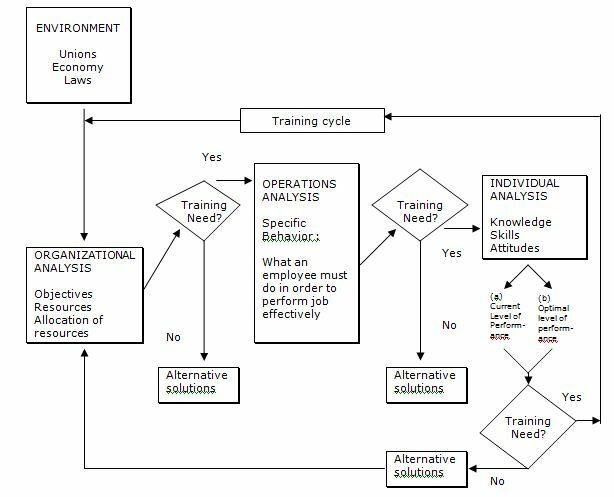 On-the-job training is demonstration-related. Compulsory life insurance and medical facilities are provided by the company to all the employees. The HR manager gets all the information from the respective department supervisors and evaluates the employee performance with the set standards in accordance to the predetermined objectives fixed by the departments. 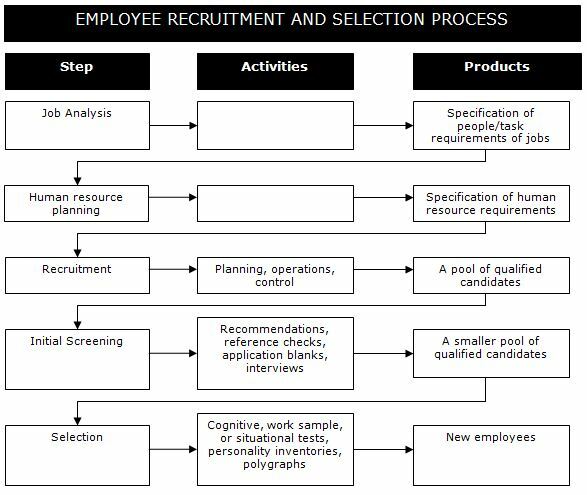 After interviewing the HR manager of SINGER, we got an organogram of the entire Human Resource department that is shown above. 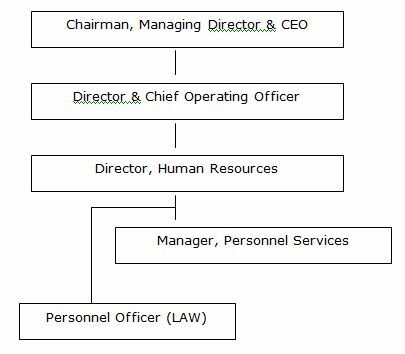 According to the organogram, the chain of command goes through gradually from the Chairman, Managing Director & CEO who are responsible for all the activities of the company. Then the Director and the Chief Operating Officer receives the commands and distributes it to the person designated by the post of Director of Human Resources. The Director of HR is the Head of HR department and he is liable for all the activities of Human Resource. He distributes the delegation of authority among two respective positions and those positions are designated by the post of Manager, Personnel Services and Personnel Officer (LAW). The next and very important phase of HR is Manager, Personnel Service. The duty of this particular position is to look over all the benefits and incentives that are offered by the company and inform the director whether the employees are being benefited by it or not. The other important position is the Personnel Officer (LAW), who is responsible for all the legislative activities, the bureaucratic rules and regulations of the Government and does negotiation among the employees. Recruiting refers to the process of attracting potential job applicants from the external or internal labor force. Recruitment is a business, and it is big business. It demands serious attention from management, for any business strategy will falter without the talent to execute it. Certainly, the range of recruitment needs is broad. Both small and big firms need talent, although different types of talent, to be successful in their respective markets. Regardless of the size of a firm or what industry it is in, recruitment and selection of people with strategically relevant abilities is more important than ever. Selection decisions are important to the business strategy of an organization. Success depends on having good people who possess the right skills and motivation to make the organization succeed. Employee selection is so important to organizational effectiveness, organization’s right to make careful, informed choices. Training and development are important activities in all aspects of life. Each day, people are faced with new situations and are forced to respond appropriately to them. Training and development are important activities in all organizations, large or small. Every organization, regardless of size, needs to have well trained employees who are prepared to perform their jobs. Even those who have been trained in professional and technical fields require orientation training to help them understand their specific roles in an organization. Present employees also need training. Because of the rapidly expanding technology and the growth of new knowledge, there is a need for continual retraining of experienced workers to perform new and changed jobs. The selection process of any company does not appear as it is in the first instance. It has to be tested over and over again until it can be reasonably perfected. The same is the case with the one followed at SINGER. The selection process starts when there is a vacancy or a job opening in the organization. The department in which the position is available first sends a requisition to the HR department. This is done by filling out a prescribed form, which contains a general, description of the post and skills required to perform it. Based on this information and by collecting further data from the concerned department, the HR people formulate a detailed Job Profile. This includes the job description, work activities, work context, etc. and also the job specifications which indicates the human qualities needed. The department provides the HR manager with a detailed list of minimum qualifications, experience, special skills, knowledge level, personality characteristics, etc. to help them design and carry out the selection process. After the job profile for the particular position is formulated, the decision has to be made whether recruitment should be done from internal or external candidates. If the choice is to promote or transfer one of the existing employees into the new post, the next step is to refer to the Grading System that is maintained so rigorously by the company. This system is a key element of the HR department and plays a significant role in the smooth running of its activities. The Grading Policy will be further discussed in the next section but for now it is important to know that through this the company can select the ones who are ready or suitable to be short-listed as candidates. Once this is done, they are interviewed and background checks of their personal files are made to see if any further training is required. If everything is in order, the best person for the job is selected. The other option available is recruiting from external candidates. As mentioned earlier, the company performs market surveys on a regular basis, which helps them decide on this option. There are more steps to be followed here. Once the decision to hire externally is made, approval of the HR director must be taken. Then an advertisement is published in all the leading newspapers of the country as well as any local ones of the related cities. This ad includes information of the position open and qualifications needed to apply for it. Also it indicates how, where and by when to apply. While the applications are coming in, the work of HR department does not stay static. They have another important step underway. This is the formation of the Board of Interviewers who will conduct the panel interview for the final selection of the candidate. This board ordinarily consists of at least three members. They are the Director(s) of the concerned department(s) where the job(s) is available, the Director of HR and one independent representative from any of the other departments to give the decision process more objectivity. The initial screening process that all applicants have to undergo involves a written test that is designed to examine their aptitudes and knowledge. Through this, applicants are short-listed down to 20 candidates. The number can be more depending on the requisite number of openings or instruction of the concerned department. These candidates are subject to the panel interview made by the board formed earlier. This is like any other interview of its kind and involves a face-to-face question-answer and conversation session between each of the candidates and the board. The questions are fairly uniform, meaning different members ask all candidates the same or similar questions. However, it is not entirely strict or inflexible. If the interviewers feel the need, they let the interview go on in different directions with the flow of topics. At the end of this process, the candidates are once again short-listed to the top 3 to 5. The panel then sits down and discusses about the chosen candidates. The final decision is made regarding the post(s) and the suitable one is selected. Another very important aspect of the HR department at SINGER is the maintenance of a Grading system, which plays a crucial role in a number of activities performed by them. This system has been incorporated after careful study and analysis by R & D and it has been followed by the company for many years, even before it came to Bangladesh. According to this, all employees of the company are categorized under one of the six grade ranges. Based on this range, information about their experience level, training level, and tenure in the job, salary base, increment records, and any promotions achieved, etc. can be found. An example of this is as follows. A well-designed training program is important for any company. As SINGER Bangladesh is in a stabilized position, so in order to maintain the consistency of their activities to serve the competitive market, it is very important for the HR department to design the entire training process in such a manner which will be effective and fruitful for the company as well as to make their employees performing at their best. To train the employees whether they are new or old, at first the HR department collects the related information from each respective department about the employee performance. Then, they evaluate the performance and try to identify whether the training is needed right at this moment or not, which is the decision making phase of training process. In this regard, they have two options, one is on-the-job training and the other is off-the-job training. On-the-job training is demonstration related that is initially applied to the entry level employees. But for further training and development, this demonstration-related training is not sufficient. So for such cases, the company prefers off-the-job training. For this type of training, they take help from external sources such as: Rapport Bangladesh and Bangladesh Institute of Management (BIM). They also participate in various training workshops. But they do not send trainees as a group. They usually send employees to training sessions based on their professional individual demand that is required for their respective jobs. SINGER Bangladesh Limited follows a strict selection procedure through which only the best and deserving candidate gets the opportunity of being a part of the company. The organization has a great control over its selection process. One of the major and first activities of HR department is to conduct a formal Job Analysis. Then, step-by-step selecting methods are strongly followed by the HR department. At this stage of selection process, they review the budget and other related issues. Written test as well as panel interview and analytical test are conducted for selecting candidates. They validate the test using concurrent validation process. That’s why, they are the pioneer in the selection process. The company practices equal employment opportunity throughout their selection and training processes. Accordingly to this, SINGER does not discriminate against any employee or applicant for employment because of race, color, religion, ethnic or national origin, gender, sexual preference, age, disability, or veteran status. The HR department’s employees ensure that discrimination does not occur in the company. Because of the strict and evident selection techniques, only the loyal and devoted employees are being part of the SINGER family. That’s why; the yearly employee turnover rate is very low compared to any other company. For example: in the year 2003, only 9 employees left the company, which is undoubtedly very much cost-effective. SINGER Bangladesh maintains a standard protocol with Public Service Commission (PSC). So, they follow all the rules and regulations of Bangladesh Government while selecting the appropriate applicants. Now, while training the employees, the company takes every precautionary initiative and tries to reduce the risk of harm to the factory employees who work with dangerous equipment, materials, or processes. After all these, even if any worker gets injured, the company carries out all the medical expenses. For upper level recruitment, the company basically uses Headhunters such as: Monwara Ltd, Rapport Bangladesh etc. So, in comparison to other companies like: Beximco, Lever Brothers and Concord, they are far behind in this recruiting stage. One of the main weaknesses SINGER Bangladesh possesses is the absence of proper internal training facilities. When the company experiences certain necessity that a particular employee needs to be trained for his/her specific job, they basically go for the training sessions offered by the outside recruiting agencies such as : Monwara Ltd, Rapport Bangladesh, Bangladesh Institute of Management (BIM) etc. Two months ago on October 7 – October 10, 2009, SINGER Bangladesh participated in the training workshop organized by Rapport Bangladesh Limited. The workshop took place at Dhaka Sheraton Hotel, Dhaka Club and BRAC Center. By this, establishing medium and long term relationships with highly skilled potential managers, it ensures itself qualified management trainees. Many rising companies of Bangladesh still are not willing to take part in this kind of training workshop. That’s why, this is an opportunity for SINGER. By this, they can ensure a quality and developed management easily. HR department can easily design the training program to catch the opportunity. One of the important threats for SINGER is its lack to provide job security towards its entry level employees. When the company sends a particular individual in a training session, he first completes the training. Then after the completion of the training period, the company sets a time of 6-8 months within which the employee has to apply his/her learning gained from the training session to show improvements. If he/she is unable to do so, the company eliminates the employee that works as a de-motivational factor for the both parties. But in this case, SINGER does not intend to change or modify the training structure to retain them. And in near future, this could be a threat factor for the company. Too much rely on the recruiting agencies for top level management could be a threat for the company. If the relationship between the HR department and the recruiting agency is not good enough compared to the other competing companies, there is a possibility that the recruiting agency can recommend for a wrong personnel for the particular position. When Human Resource Department was introduced at SINGER 1987, the position was basically created to diversify responsibilities of a single managerial position. They started their journey with a single personnel manager who used to carry out basic HR responsibilities. But when we compare the past with the present situation, we found out that the main functions of HR are still almost the same except the growth of manpower. The number of employees of HR was increased as did the incentives the company offered. 1. No formal Job Analysis was conducted. 1. One of the major and first activities of HR department is to conduct a formal Job Analysis. 2. No step-by-step selection process was followed; such as : while recruiting a new employee, the HRD did not go through the budget review and job analysis that much carefully. 2. Step-by-step selecting methods are strongly followed by the HR department regarding the budget review and job analysis. 3. Their major priority was written test. 3. Written test as well as panel interview and analytical test are conducted for selecting candidates. 4. Test validity was not purely associated with the selection process that much. 4. They validate the test using concurrent validation process. 1. At that time, performable works were just demonstrated to the employees and they were to carry out those responsibilities. If problems were faced, the HR department was there to help them out. 1. Formal training sessions are strictly utilized and employees who require those types of training are sent to attend those sessions. SINGER, as a company, is quite matured and has come a long way from its inception. It has had its phases of ups and downs and it has come out of most of them with flying colors. It has faced many problems over the years and it has been able to resolve them through long standing debates, research or mere experience and practice. However, the company is not entirely perfect. While recruiting top level employees, the company basically takes helps from different recruiting agencies such as : Monwara Ltd, Rapport Bangladesh etc. According to the HR manager, they need to build up a platform through which they can be capable enough to recruit the top level personnel by utilizing their own system. One of the main problems that the HR manager of SINGER Bangladesh revealed to us is the lack of proper internal training facilities. They think this is the sector where they should prioritize to make some improvements and solve the problem. One of the main problems that the HR dept. of SINGER suffers is the same as that endured by most other companies. It is the conflict between HRD and any other department while hiring new recruits. Although the whole selection process is conducted by the HR department, the concerned department keeps a close watch over it. During the final selection, as mentioned before, the director of the related department is also present in the panel. It so happens many times that the HR selects one person as having the best and most suitable qualifications and skills necessary to perform the job as described in the profile. However, the concerned department head chooses someone else who may have come 2nd or 3rd in the selection ranks. In such a case, there might be a conflict raised between the two departments. The HRD feels that its role has been undermined. On the other hand, since the new employee will be working under a different department, the head or director should have a say. His decision is to be considered final. However, if the HRD had forced their choice to the dept., the latter tends to become extra strict on this selected one. And after a while, if that person does not live up to the standards, the HRD is blamed for it. This is a problem that the company is trying to control through better interdepartmental communication and relations. In line with the problems faced, it is safe to say that the policy of better department relations is the way to go for resolving it. This is not the only recommendation that came my way. From my conversation with the HR manager, I found that many feel the need to improve their selection process. Although it is currently one of their strong aspects, it has reached a stage whereby an up gradation is imminent. In addition, with the increasingly changing world of business and fast moving skill requirements, the need to stay up-to-date in their recruitment process is felt even more. It can be recommended that the initial screening process be made more strict and the interview sessions more rigorous. The finally selected top 3-5 should be further interviewed and tested so as to identify the best. The reason for recommending improved selection has to do with cost conservation. As is mentioned before, the company spends considerable amount of resources in training and developing its employees. It has been deduced that with better recruits, there will not be need for as much training to make them suitable for the job. It is true that there are still some drawbacks in the HR practices of SINGER Bangladesh but the path the company crossed so far was not obviously “bed of roses”. If we look at the comparative HR analysis between just after this company’s beginning and current practices, we can see that the company is adapting to newer and newer methods each and every day. For this reason, it can be said very easily that if the ongoing modifications persist, a better future is waiting for SINGER.